Linux on the iPhone: NAND filesystem now readable! Amazingly enough, the FTL_Read stuff from last night was pretty much correct! After that, it was relatively trivial to port over the HFS+ code I've already written (which was in pure C... finally that [fail] design decision has been vindicated =P). 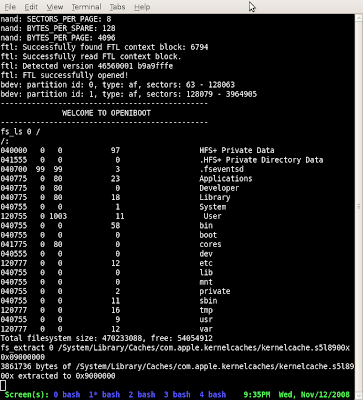 As you can see in the screenshot below, with the latest Git revision, you can browse the filesystem from openiboot! Next on the list is to port openiboot over to the iPod touch and iPhone 3G. It's probably just a matter of putting in different numbers for the GPIO ports, but we'll see. After that, I will implement poorlad's bootmenu (which everyone seems to like). After that, well... We have pretty much all the devices now, so we'll start looking at the Linux kernel. If you're a Linux kernel guy who would be willing to help (preferrably you have experience porting Linux to new ARM platforms), please leave a comment here. I can do most of the muscle work, but it'd be nice if someone can show me how to set up the source tree properly for the new port.